Sacred Heart Catholic Academy has 3 Pre-K For All classrooms. We accommodate 18 students in each class with 1 teacher and 1 teacher’s aide. We offer an *optional* Religion and Kindergarten Enrichment Program from 2:20-2:50pm on Mondays, Tuesdays, and Thursdays. Early Morning Dropoff and After School are also available for Pre-K students for a fee. We are on the Inspire curriculum track and follow 10 units of study – Welcome to PreK, My 5 Senses, All About Us, Where We Live, Transportation, Light, Water, Plants, Babies, and Transformation. This curriculum is Center-based and the children learn primarily through play! Sacred Heart Catholic Academy has a brand new playground where the children can develop their gross motor skills while enjoying some fresh air! Are they really learning in Pre-K if all they do is play? When young children play, they are enhancing social-emotional skills that are integral to their development. Additionally, the teachers go from center to center guiding their play and their interactions to enrich not only these skills but their knowledge as well. 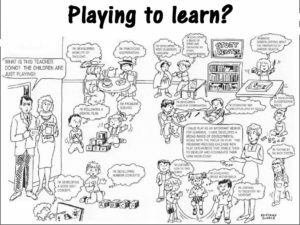 Check on the image for more information about the benefits of learning through play! Welcome to Unit 6 – LIGHT! The application for Pre-K For All for the next school year will open in early February. by March 15th and submit your application. You will be notified in May if you have been placed at our school at which time you can make an appointment for pre-registration.